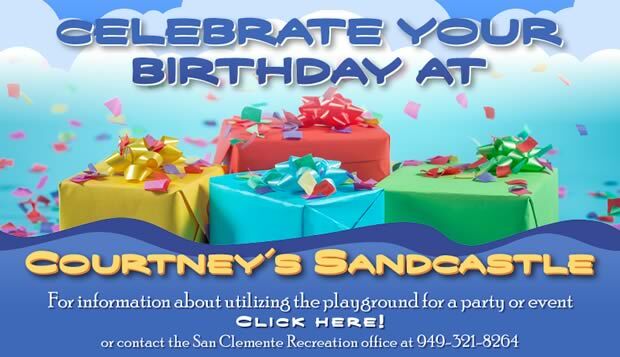 Birthday Parties at Courtney’s SandCastle! If you’re a San Clemente resident, you can reserve space in the playground for just $25/hour. The playground is ideal for party fun! If your birthday girl/boy is between the ages of 3-12, you might also enjoy including the Fun on the Run Mobile at Courtney’s: 60 minutes of organized games and activities. Plan ahead: reservations are accepted up to a year in advance. Click Here to learn more. For more information on utilizing the playground for a party or event, contact the San Clemente Recreation office at (949) 361-8264. Click here for Park Rental Policies to obtain the Park Rental Policies and Application.